Your generous support is much needed and appreciated. It will allow the ALABCA to better serve the state of Alabama’s amateur baseball Players & Coaches. You’re donation will go towards general ALABCA expenses and / or the programs they run, unless you specifically choose a program below for where you want your donation to go towards. 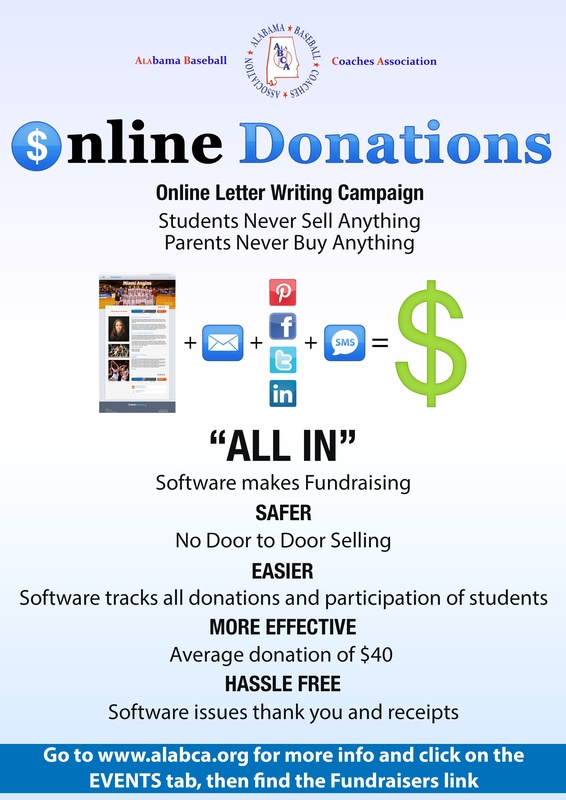 Type in the program you want to sponsor should that be the case. Miracle League Sponsorship – The goal each year of the ALABCA is to sponsor a team and/or outfield sign in all the 13 Miracle Leagues located throughout Alabama. The participants of these leagues are mentally and/or physically handicapped children and adults. The “First Pitch” Dinner held each January helps the ALABCA achieve this goal. Scholarship Fund - 3 $1,500 scholarships are awarded each year, 1 $2,000 one also. Bibles and Baseball Gear - The ALABCA Executive Director will personally take these items to the Dominican Republic every year or two when he goes there to do clinics and faith work. Community College Sophomore Workouts – Each fall the ALABCA works out approximately 240 Community College Sophomores for free from the 18 C.C.’s located throughout the state. Event Cost: Feed the players and 4-year college coaches and pro scouts, event insurance, roster packets, event advertisement postage. Youth League Volunteer Coaches Clinics – Free Youth League Coaches clinics offered throughout Alabama each March/April. Unsigned High School Senior & Undrafted College Senior Workouts – Free workouts in front of community college coaches (for high school seniors) & professional scouts (college seniors) for each group of baseball players looking for an opportunity on the next level. Underclassmen Regional Workouts & All-Star Event – 500 high school underclassmen have the opportunity of a lifetime to make an All-Star Event Team in May and participate in the June All-Star Event in front of on average 35 – 40 college baseball coaches and 4/5 professional scouts. Thank you %NAME% for making the Donation.